From the 1900’s to the 1970’s, technology companies went from producing bulky recording machines to even bulkier versions of the first computers. Since then, they ditched the design, which resembled a microwave more so than a computer, for a slick and thin look; but there was more to this development than just aesthetic achievement. In recent times, technology has developed in terms of both capability and scope, offering innovative new products like personalized computers, cloud computing, and artificial intelligence. But many of the companies driving these changes were not around for the advent of the first gargantuan, recording machine; in fact, most of the largest technology companies today are younger than 50 years old. Unlike its competitors, IBM is one of the only tech companies that has been with consumers since the beginning of the 20th century, reinventing itself through organic growth and fruitful acquisitions. As we move into the 21st century, IBM is trying to rely on that same successful strategy to keep itself relevant, as shown by its announcement to buy Red Hat, a company focused on open source software products, in a $34bn deal. IBM was born from the merger of three of the largest American companies of the 19th century: the Tabulating Machine Company, the International Time Recording Company, and the Computing Scale Company. These three companies, merged together by Charles Ranlett Flint in 1914, formed the Computing-Tabulating-Recording Company (CTR), which in 1924 was renamed “International Business Machines”(IBM). Today IBM is one of the oldest U.S. tech companies and it offers a wide range of products and services that fall in the categories of cloud computing, cognitive computing, e-commerce, data and analytics, Internet of Things, IT infrastructure, mobile and security. In addition, it is worth mentioning that IBM is also a major research organization, holding the record for most U.S. patents granted yearly to a business for 25 consecutive years as of 2018. Inventions by IBM include the floppy disk, the hard disk drive and the UPC barcode, just to name a few. Although Big Blue (IBM’s nickname) has been on the top for a long time, IBM’s mainframe being the dominant computing platform during the 1960s and 1970s, recently it has experienced a constant decline in its revenues: from the peak of 2011 they were down 26% to $79.139 billion in 2017. In order to reverse this trend, IBM has introduced the strategic imperatives framework in 2015 as a way to show that it is moving their clients to the future. The strategic imperatives are not separate businesses but are all the revenues coming from IBM’s offering addressing opportunities in analytics, cloud, security and mobile. Although IBM missed consensus estimate on revenues by 2% in Q3 2018, strategic revenues were still up 11% to $39.5 billion in the past 12 months, with cloud revenue leading with a gain of 18% to $19 billion in the past 12 months. An important offering of IBM’s cloud is its Cloud Private, a hybrid cloud, which provides the clients with the attributes of a cloud behind their own firewall and give them increased portability of workloads across any cloud environment. Therefore, the acquisition of Red Hat can be seen as a way to keep up with the best of the class (Amazon, Google and Microsoft) in the cloud field. Founded in 1993 by Bob Young, Red Hat is an American software company providing open-source software products to the enterprise community. It provides storage, operating system platforms, middleware, applications, management products, and support, training and consulting services. In 2012 Red Hat became the first one-billion-dollar open source company and its business model is based on the sale of subscriptions for the support, training, and integration services that help customers use its open-source software products. In addition, in 2014, CEO Jim Whitehurst announced that Red Hat was shifting from client-server to cloud-mobile and its leading position in the latter lays the foundation for the buyout. From a financial point of view Red Hat’s revenue for the twelve months ending August 31,2018 was $3.157 billion, a 19.38% increase year-over-year; its EBITDA for the same period was $0.626 billion, so a 20.01% increase year-over-year and its net income for the same period was $0.286 billion, so a 6.44% decline year-over-year. Political stances towards technology companies have taken a harsher turn in recent times, as accusations of liberal bias and security breaches fly across prominent politicians’ twitter accounts. However, notwithstanding critics’ beliefs, the technology industry remains immensely important, with its capacity to create social change only paralleled by its immense size and complexity. The technology services industry is populated with everything from small startups to large corporations, all of which are racing towards the development of the newest intellectual property and tools to serve our modern time. Companies such as Apple, Amazon, Microsoft, Google, and Cisco produce everything from consumer electronics and cloud platforms to personalized ecommerce businesses and SaaS deployments. The cloud computing sub-industry, while one of the youngest within the tech umbrella, is valued by Gartner at $305.8bn, with a 2-year CAGR of 13.4% pushing its value to $411bn by the decade’s end. While its origins were technically in the 1960’s with Joseph Licklider’s development of ARPANET, many believe that the idea of “cloud computing” in its modern sense was not developed or implemented until 2006. The market is based around the creationof shared pools of configurable computer systems that can store data and other services, implemented with the goal of achieving greater coordination and economies of scale across organizations. Modern cloud computing is based on three different “as a service” (aaS) models: infrastructure (IaaS), platforms (Paas), and software (SaaS). Customers can also choose between a public, private, or hybrid cloud deployment, depending on their varying security needs and willingness to share software with other corporations. Public cloud systems, the fastest growing choice of cloud consumers today, are when corporations’ data and other services are managed by providers, such as Microsoft, on a data system shared with other customers of that provider. In contrast, private cloud systems give corporate customers greater control over their data, as all information is held and managed by the company and its existing data centers via a cloud infrastructure that is incorporated by the provider. Finally, hybrid cloud systems attempt to combine the two by creating a bridge between on-premise infrastructure and public clouds. In a hybrid cloud scenario, high security information is stored on the private cloud system while low-security information is entrusted to the public cloud, with the ultimate hope of capturing both the security measures of the private cloud with the flexibility of its public counterpart. The direction of the cloud computing industry is being shaped by a dominating trio of firms: Microsoft, IBM, and Amazon. While other players like SAP, Salesforce, and Google are also involved in the industry, their quarterly revenue streams consistently trail the big three by anywhere from $2bn to $3bn. But, to their credit, the big three’s growth, services, and incumbent advantage make them extremely hard to compete against. In the past year Microsoft took in nearly $18.6bn in revenue through their cloud computing division and proprietary Azure software. For the financial year 2017, Azure revenue growth rates were at 93%, 97%, 90%, and 98% in each respective quarter. In contrast, IBM pulled in $17bn in revenue in FY2017 from its cloud computing division, a surprise to many in the sector. The majority of this growth was a result of incumbent advantage, as $7bn of the $17bn came from IBM’s cloud conversion business, which helps its existing corporate consumer base transition to cloud services. Similar to Microsoft, IBM also has high-quality IaaS, PaaS, and SaaS offerings. Finally, Amazon garnered $17.5bn in revenue from cloud computing in FY2017; but unlike Microsoft and IBM, their strengths come widely from a single IaaS service: Amazon Web Services. While some may consider Amazon a “one trick horse” for their concentration on Amazon Web Services, this focus on one business service also earned them first place in the of public cloud sub-industry. Unlike the overall cloud computing industry, the companies dominating the public cloud market are Amazon, Microsoft, and Google; notably, IBM fails to make this exclusive list. With an annual growth rate of 17.3% bringing its value to $206.2bn by 2019, the public cloud computing market represents one of the more attractive segments of cloud computing. While the “big three” ranking may slightly differ from public to private and hybrid cloud computing, the top firms in each category all remain notably devoid of smaller startups. Often times these larger corporations are able to maintain their market position because of their incumbent advantage, breadth of offerings, and economies of scale, effectively locking out startups that exclusively work with cloud products. While “cloud native” startups may be producing higher-quality and more innovative solutions, potential corporate clients hesitate to entrust their most sensitive data to less established companies. Additionally, many corporations want a single company that can handle their premise systems, new cloud systems, and the slow transition between the two; a key aspect that these cloud exclusive startups are unable to provide. On October 28, IBM announced that it will buy Red Hat in a deal worth $34bn. IBM will pay $190 a share, which represents a 63% premium, if the share’s price at the time of the announcement is considered, but it is a 12% premium if Red Hat’s recent June high is considered. IBM is financing the deal through cash and debt, in particular J.P. Morgan and Goldman Sachs are providing a 364-day bridge loan for a value of $20 billion. In addition, it is worth mentioning that IBM’s bridge loan sneaks into the top 10 biggest US bridge loan ever arranged and that, while the company will not be changing its dividend payouts, it will suspend its share buybacks programs for 2020 and 2021. The deal is expected to close in the second half of 2019. From a managerial point of view, Red Hat will continue to be led by Jim Whitehurst and Red Hat’s current management team. Jim Whitehurst will also join IBM’s senior management team and report to Ginni Rometty. What IBM’s CEO Ginny Rometty has done is a very bold move. A company that has been there for a century is always hard to reinvent and keep up to date, especially in a fast-paced environment like the tech industry. Strong pressures were put on Rometty’s shoulders to solve the problem of stagnant growth and her response was a drastic repositioning of IBM in the market. The key to understand this acquisition is, indeed, in the battle to expand in the cloud business, a booming market yet to be established and in which IBM is betting big. Its strong point is a technology that connects the new cloud platforms with the pre-existent private databases forming a hybrid service particularly in demand because all the companies that are now shifting are forced to combine the two platforms. IBM is the leader in this segment, but it has to strengthen its position, otherwise the advantage is going to be eroded quickly by fierce rivals. To this end, Red Hat provides a number of advantages. Red Hat possesses a technology called OpenShift that can break down monolithic corporate software programs into many smaller inter-connected segments, called containers, that can be then moved to different computing platforms effectively. This was already used in partnership with IBM cloud services and the synergies are evident. Another advantage is the access to Red Hat’s 100,000 enterprise customers. They are all slowly but surely shifting toward a hybrid data infrastructure, but research shows that up to 80% of business workloads have yet to move to the cloud, hinting that the growth potential is immense. One reason for the slow shift is the proprietary nature of the cloud industry, in which it’s very hard to use multiple data platforms at the same time and switching or moving to another has significant costs. Red Hat has a unique position in the market, as it is an intermediary software provider that works with every platform and is able to make them work together neatly. 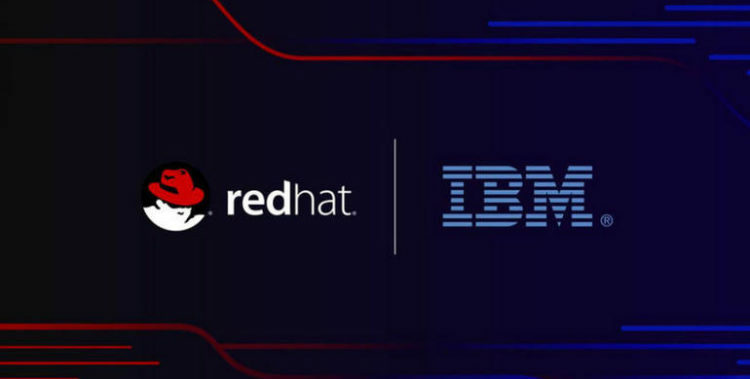 IBM would therefore be able to position itself as a hybrid cross-platform service and dominate the market thanks to the open source community, that generates a strong network effect, coming from the Linux platform of Red Hat. Overall the acquisition makes strategic sense and very few experts argue on that, but what raised some eyebrows was the huge premium higher than 60%. This must be put into context as almost the entire tech industry lost market value in October, indeed the premium to Red Hat’s recent June high was only 12%. In any case, the high premium shows that IBM was in desperate need for a strategic turnaround, and therefore willing to accept a higher premium to try to stay relevant in the market. The market performance of the shares has to be put in the context of the market’s rough month of October. The S&P went down 6.9% because of a nervous market due to raising interest rates and trade tensions. The tech industry was hit particularly hard because of the higher duration of their stocks and their prices, heavily dependent on expectations. On top of that, IBM’s earnings report was weaker than expected, therefore the stock plummeted from $150 per share to around $115 in just one month. The announcement of the deal barely stabilized the situation, because it was perceived as a good strategic bet, but one that will take a long time to pay off and that will put more debt on the company and cancel share buybacks for two years. The announcement came over the weekend on Saturday 28th and on Monday the price fell from $124 on Friday to $115, marking a drop of more than 7% in price. Despite this initial reaction the stock gained traction and rebounded up to $124 after a week. On the other hand, Red Hat’s market value jumped from $20bn to $30.5bn in the days immediately after the announcement, as the price followed the valuation for the acquisition. On the other hand, Guggenheim Securities, Morgan Stanley advised Red Hat, with Skadden, Arps, Slate, Meagher & Flom LLP and Affiliates acting as legal advisor. Copyright by Bocconi Students Investment Club | Statements made and opinions expressed are strictly those of the authors and do not represents in any way Bocconi University. Bocconi University does not review, approve, or endorse the contents of personal pages, nor does the University monitor the content of any page.